The New Mission marquee beckons again following a 4 year, ten million dollar renovation by Alamo Drafthouse Cinema. The New Mission Theatre was originally opened in San Francisco in 1911 and experienced various incarnations. Following its closure in 1993, the site fell into tragic disarray. 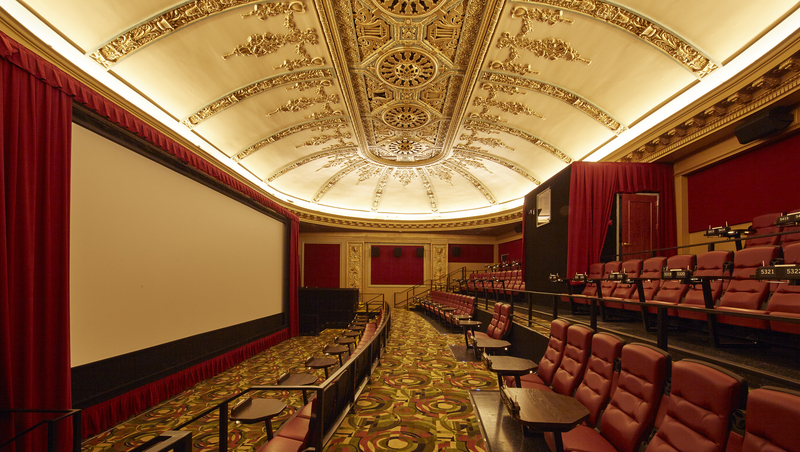 Alamo Drafthouse hired Architecture Resources Group to restore the city landmark while introducing the modern concept of a dine-in movie experience. The restored theatre is illuminated throughout with Tempo’s expansive portfolio of theatre and architectural lighting. The alcoves in the lobby and the intricately detailed dome ceiling in the main auditorium are dramatically enhanced with C6S LED linear cove luminaires. Three-inch modules of C3R LED linear are installed under each dine-in table for menu reading with minimal distraction. Tempo’s SWIII Wall Light and Vertical Post Lights partnered with LPS raceway and Guardian step nose systems provide safety illumination in each of the theatres. Seat Light II and Vanguard illuminated displays provide further wayfinding and seat identification. To learn more about the Tempo lighting installed in the New Mission, click on the product links.